As you can see, I haven't stitched much, mostly because I tend to fall asleep in the evening, so no long night stitching sessions. Not to mention a little cleaning session. Basically my house had stitching stuff all over. That's not the way to go. But I stitched the roof, and started the white though. You might notice a colour difference between this picture and the other one: photo vs scan. Yesterday my scanner wasn't recognized by the computer for some reason, and I was in a hurry, so I used my camera instead. I usually scan wips, because the colours are consistant. If you use a camera, it will depend on so many factors, you will have different hues everyday ! It's Friday, the week end approaches fast, and I have to find motivation to do finishes... And before that, clear out the craftroom, or it's not workable in there. I would also like to say hi to Edda, Lnanaa and the others who come often but don't dare commenting. Nice to see you here. I didn't stitch for that long, because I was so tired I was making mistakes upon mistakes. If you look closely you can see the pinky bit on top of the door isn't centered, and will need to be "surgically removed". Yes, no wip pictures for this piece, as I stitched it in 2 evenings. 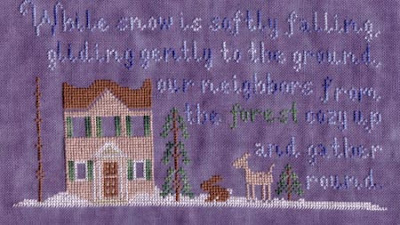 It's a little piece from Little House Needleworks. I wanted to do something small as I was expecting my 123 Stitch order, and it arrived yesterday indeed ! I added a new feature to this blog: a slideshow of my recent finishes on the right hand side... I think it's rather neat, don't you ? Shops are preparing for Christmas, Nature feels like winter, but I really don't feel in a Christmas mood. 4 weeks before the holidays and 2 weeks of French stitchy madness. I need a break, and it's frustrating that it doesn't come sooner. oh well ! 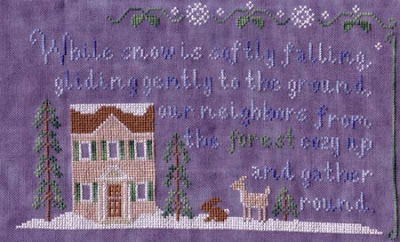 So I'm not really in the mood to stitch strictly Christmas stuff, although I will stitch winter stuff. I'm nearly finished gift/secret stitching, so I might be able to show you some stuff soon. 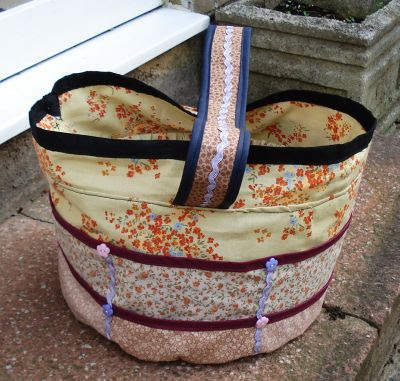 In the meantime, I spent all tomorrow making this "panier de brodeuse" (needlecraft basket). 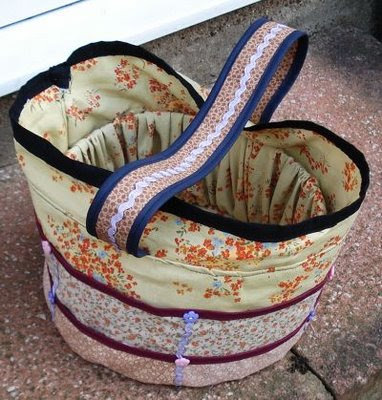 I discovered the tutorial here and nearly a hundred people already made that bag !!! Originally I thought it wasn't for me. But then I thought about the holidays, and the fact that it would be perfect to get all my stuff in one place at DBF's. Here I just have stitching stuff all over the house with noone to complain about it, so.... it's not so much an issue. And the rest of the bag is made out of a huge piece of fabric I got ages ago. I found the purple "croquet" in a local LNS, and I had the buttons since ages as well. I think it's the fancier piece of sewing I've done so far, with biases and a round form, not to mention the pockets !!! I realised that with all the moves and such I haven't replied to the SBQs in ages !!! When you have to frog out stitches, do you reuse that thread or do you start over with a new strand? It all depend on the state of the thread of course. I try to be careful when frogging, so I can usually reuse at least part of thread. Especially since DMC threads are sturdy enough for that treatment !!! If you were a cross stitch designer, what would your design style be? 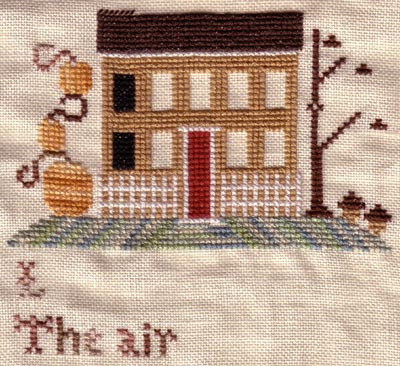 At the moment, I'm very much into simple country style, like Little House Needleworks. So I suppose I would design stuff like that. Or things with speciality stitches. Right now I try to design little things for ornaments, so it has to be small, and sort of sparkly. No, I'm a rogue, I just let the threads do whatever they want. As the final result is nice, why would I spend extra time railroading? Most of my stitching is for me. Or, more precisely, with no recipient finality. I stitch gifts for birthdays and Christmas, but I feel giving a stitching project again and again looses a bit of its impact on people. What for you means to achieve mastery as a stitcher? Is there such a thing as mastery? Stitching bigger projects isn't very a mastery, it's just a proof of patience. Maybe using speciality stitches? or designing your own projects? Sew Discounted and Sew and So. Not sure what BAP means... I stitched "Secret Garden" twice because my mom wanted it a second time. And I'm titching Garden Pleasure a second time as well. How did you get started stitching? Was there a person that inspired you? Needlework has always been part of my life. I did a bit in school, but I guess my mom and my grandma are my big source of inspiration. I've always seen them knitting, crochetting, sewing or stitching... So it's just natural. Have you ever thought of getting a rider on your household insurance to properly cover your stash (some of us have quite an extensive stash that an average household policy wouldn’t fully cover) in the case of some sort of damage to your house that would destroy/ruin charts, fabrics, floss, etc? Never thought of that, no... But part of my subconscious wishes to start from scratch, so... If such a house catastrophy should ever happen, I would be so distraught by the loss of irreplacable stuff (finished projects, memorabilias I have kept since I was 6...) that material loss seems secondary. What do you love to do that many people hate? What do you hate to do, but do anyway? Sorting out threads out of kits. Although now it's not as bad as before, they are removing the fun out of it. I hate backstitching those very detailled projects, but of course it's necessary, so.. I end up doing it anyway. I usually act on impulse. So it could be anything. If I have no inspiration, I would turn to UFOs by default. I don't realy kit projects. I keep wips fabric and patterns in a drawer. The threads are all on bobbins in 3 boxes, sorted by number. I use a smaller box to put the threads I'm currently using. 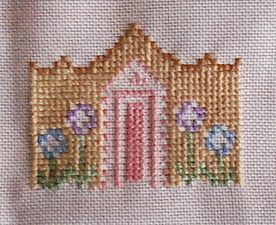 Usually I only use one needle during a project, unless I have a border needing stitching several colours at a time. But this is rare. I tend to use any of the needles on my pincushion, so I end up using the same needle again and again. I only take care of the size of the needle, to use what's most appropriate for the fabric I stitch on. If you could only stitch one more piece what would it be and why? Instinct? Obviously my blog is what I like to read. Otherwise there is no point writting it. I'm first and foremost looking for blogs with projects I like. I like to be inspired. Discover projects I wasn't aware of. Projects that give me ideas. With original finishes. Do you find yourself stitching faster when you are getting to the end of a design? This is a Drawn Thread freebie, "Tree fob". I used a Needle necessities for the green, and red DMC variation around (+cord). Red and irridescent beads on the tree, and old sort of bronze beads around. This winter ewe... has a story in itself... Looking back in my blog, I stitched it beginning of last years Christmas holidays. Apparently i wanted to stitcht he house "DMC 341, but I met with Lili and she let me borrow some Needle Necessities threads for the house and the tree. So I have no idea what reference they are, maybe Lili could help us with that? All over the place !!! I feel frustrated not to have my order from 123 Stitch. On top of it, Lauren's advice was good, so I joined the WxsW group, and I plan on starting a lovely Christmas tree. So all in all... no picture. better luck next time !!! As planned, I finished Simply Snowdays yesterday. Still have to turn it into something like a banner... The end was a bit fiddly, because of the precise backstitching and french knots on the birds. Now I'm officially stitching "Gifts of the season" from Gail Bussi. It's coming from Cross Stitch Gold from last year. I have a sort of love/hate relationship with this pattern. I don't know why. Sometimes I feel like it's the cutetest thing, and sometimes i find it too naive. Right now I'm just not so sure about the fabric I took: DMC 32ct winter white linen. There's ahuge difference between DMC and Zweigart linens. French linen are close to Zweigart. But these prepacked DMC linens are weird: the holes are so big you can see through the fabric, it's quite transparent. Note that in blogger I don't see the commenter's emails, so I can't guess your email if you just comment. What happens when you stitch something so long it doesn't fit the A4 size scanner, and you're on a grey windy day in the UK? Sub-optimal pictures. Yesterday I was a bit on the down side, so I didn't stitch much, but I hope to be finished with this project by tonight. I just have white/3865 patches, and a little of backstitching. It's funny to see how in certain lights white and 3865 are identical, but in others 3865 is a bit creamy. There is also a sort of "texture" difference". 3865 is more visible and dense on this cloudy blue fabric than white. I will turn this into a banner of some sort, so I can display it on the mantel piece. The next project... I don't know. I dug up some Sanman Originals snowmen patterns, but also some freebies, and there are still the ornaments in mind. I feel a bit frustrated because I'm still waiting for my order from 123 Stitch, which includes 2 winter projects from CCN and LHN. What blocks the process is the Gingerbread Cottage pattern that is back ordered. Does that sound familiar, Jenn? I think american companies just wait until the whole order is there to send it, while British companies send stuff one by one if necessary. There seem to be a difference in postage policies, as int h US they charge you a lot, and in the UK you get low or free postage. I just hope to get my order before Dec 20th, so I can stitch that over the holidays, that would be great !!! The "in and out" feed is fun. I would have never have guessed I had visitors from so many countries !!! Sue, Blogline is what they call a feed aggregator. Blogs have an extra page called the rss feed, which is basically the posts of the blog in some special format that programs like Bloglines or Google reader can read and display on their site. People get an account on these websites, and decide to "subscribe" to blogs. So instead of visiting each individual blog, they just go to Bloglines, and they have a list of blogs they read over there. You can see when a blog is updated so it's a real time saver !!! Start of the week end ! A new week end arrives, the weather doesn't call you outside... and you have no obligation stuff to do. How does that sound? 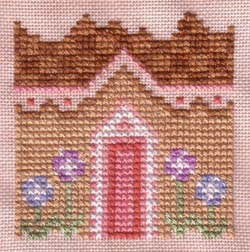 I followed this tutorial, but used Cindy Valentine's little gingerbread people from her sampler in The Gift of CrossStitching. I also added blue Rhodes diamonds. The surrounding is in 4210 red DMC variation, button hole stitches. The cord is from the same thread. The red on the gingerbread people is red beads. This is a first attempt, and next time I see I will have to focus on putting stuff under the gingerbread people. Here is Simply Snowdays as we speak. Now for a true story. The snowmen are calling for DMC 3865. I couldn't find any in Hobbycraft, but I ordered it along with other threads and fabric from Sew Discounted on Wednesday night. Yesterday I got my order, but no DMC 3865 !!!! Apparently, a rarified colour... White with a creamy twist, but not quite cream like DMC712. As you can see, the letters and most of the rest of the design is done, so I felt I had no choice but stop and do something else until I get DMC 3865. But this morning, I got an enveloppe from Sew Discounted with the skein... I'm saved !!! I think that's why I like to order from Sew Discounted and Sew and So: they will dispatch what they have as soon as possible (if you order in the morning, you could get stuff the following day), even if the order isn't complete. Anonymous (please sign your comments, name or nickname, otherwise I have to call you "Anonymous", it's a bit ridiculous;) ), even if people are attracted by my magazines reviews, well, though, I'm not going to buy magazines just so they know they can spend their money for something else ! I get no money from blogging and making the reviews. But magazines cost loads of money. Here in the UK it's nearly 4 pounds a magazine, Multiply by the number of magazines and issues... That's a lot of money I could use to by nice stash with, especially if no chart interest me in the mag !!! Thank you so much for all your views on comments and blogs and things... We all seem to agree on those. Apparently, what screws things a bit is the feed readers. I'm a real Bloglines afficionado, so I won't bad mouth the readers. But the statistics aren't right anymore. I mean, if you put a counter on your page, but half the people are using feed readers, you will only be aware of half the people visiting. Is there a way to know who subscribes to your blog, or at least the number? Yesterday was quite dramatic for me. I don't know if it's the flu vaccination or stress, but I went home with massive headache and nausea. I had to cut the daily DBF phone call short because the pain on the left side of my brain was so intense DBF talking was like a knife poking my head. I ended up sleeping from 6pm to 6am, and now I'm sort of fine, just a bit tired. But it ment no stitching yesterday evening... Anyway I'm waiting for DMC 3865 to arrive, I hope it comes today from Sew Discounted !!! I resubbed to The Gift of CrossStitching. Typical thing, I didn't resub because I didn't find anything interesting int he past issues, and all of the sudden... 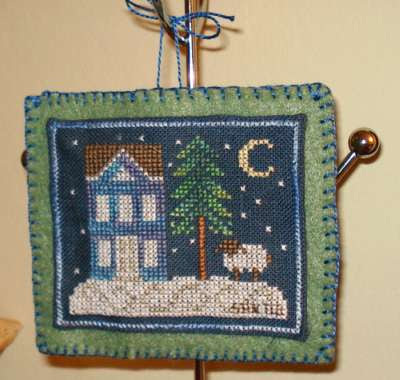 I fell in love with Cindy Valentine's sampler. Not only is it a sampler, but there is also a biscornu, and elements can be used seperatly. This post isn't a rant. It's a general reflexion on life on the web. I don't want you to think I'm grumpy and ungrateful... Comments are parts of blogs, and I think it's an interesting subject of discussion, so please leave a comment to express your views. I'm telling you, I'm feeling left out of the stitchers world at the moment, my blog seems to appear rarely on other blogs blogrolls, and I get fewer and fewer comments. Dunno what happened. Is it because I moved my blog? Someone suggested a while ago it was because I used to post everyday, then only a few times a week (when I moved) but now I post everyday again, but I still only get 3 comments a post. In comparison, some people post only like once every 2 months and get 10 comments in 12 hours. As a scientist, I can't help but wonder what the mecanisms of the comments work. I know that I'd be fed up and lacking inspiration to comment on posts showing wips everyday. What can you say? "great progress!!! ", "well done!!! ", and this also goes for finished pieces, apparently. I'm the first to suffer from "I want to comment, but I can't find anything interesting to say other than "congratulations", and anyway someone had already wrote it". So I'm trying to talk about other things that might get reactions. Obviously I fail in a spectacular way these days. But it's not like I have a fascinating life. I can't even tell you about the kids I don't have. So what should I talk about? Talking about gardening and my life was a big bust. Showing new finishings, personal patterns and personalisation of established designs didn't provoke much reaction either. But what is interesting is that comparing to last November (a year ago), I only have 3/4 of the visits I ihad back then. So... what changed? Normally you should expect more and more visits on a website. So decrease is not normal. I know my website is well indexed in google, but people don't really reach me this way. Most visitors are returning ones, not coming from other blogs either. Now it's your turn to express your views on the subject !!! I started with not finding the Mill Hill snowman (Lili, you know the one I'm talking about...). Then I search for my watch 10-15min when I had to leave for work. Not to mention that the move to St Pancras means a 25 min trip from home to the eurostar station (vs 1h30 before). Seriously, I've been in this country nearly 10 years, and I was registered to GPs for nearly that long. Why do I have to bring a birth certificate (it's in french anyway, won't be able to read it!) or passport for? And I'm still waiting for my 123 Stitch order because Gingerbread Cottage is backorder because of the demand. At least the lady at the website was nice and answered my email in 5 minutes ! And finally, I had forgotten to show the framed Tearoom, so here it is. I was saved by my frame stash, as I had this frame already. 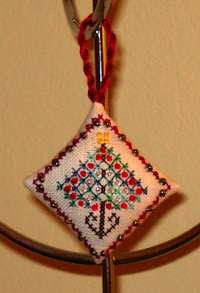 I was surfing around, and I found an interesting website: Christmas ornaments stitch along blog. People coming together to show their ornaments... very inspiring. They also have links to tutorials, and that's how I found the idea and method to make a pendibulle. This blog is also worth a visit, loads of ideas and lovely stuff. So I decided to try and make a pendibulle. I used a piece of blue aida, and designed a little thingy myself. Any ressemblance to something seen elswhere is only subliminal (I get influenced by what I see on the web?). Jenn, I can only advice you to stitch LHN designs (I love them). Why not try the ones in JCS ornaments magazines? They are small, and you will have an ornament at the end ! Otherwise there are patterns of all sizes, even very small ones. And Garden Pleasures is finished ! I couldn't help adding eyes and a mouth to this lady. This project is very very personalised. The dress and fabric are blue to match my grandma's tastes, and I'm sure you would prefer a lady with a real face. I also added "BM" on the flower pot, for "Bonne Maman", which is what I call my grandma. Now I have to try and find a frame for it, and it will be ready for Christmas !!!! I also did a bit of framing today. As I said before (I think), I didn't like the light wood frame for Acorn Hill, and anyway it was a bit crooked. So I used another darker frame. More "autumny". This time I stuck the design onto the backing cardboard with double sided tape after cutting to the right dimension. I did the same for Old Gardens, and Tearoom (not pictured here, as my pictures are bad). I also framed the Renaissance Lady. To take my pictures I decided to go in the garden for natural daylight. It's difficult to find a place, so in the end I've put a nail in the fence, so I can reuse the spot easily. I decided to make a Christms cushion, with the LHN bunnies (JCS Ornaments 2007), and, as I was at it, I made a tutorial to make this decoration cushion. And in the spirit of the season, when we are more encline to finishes, I linked my tutorial on the left sidebar. 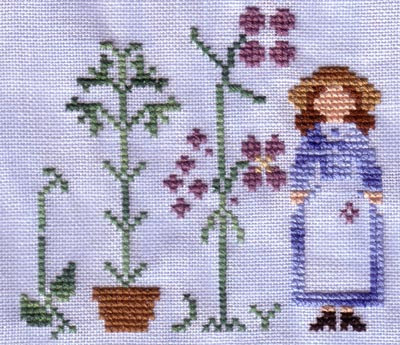 Yesterday I only stitched in the morning and at lunchtime, so I didn't really progress on Garden Pleasures. 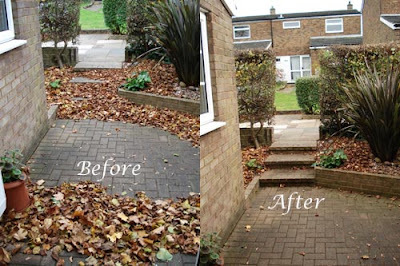 But if you see the picture below, I had to pick up a lot of leaves in my front garden. I did it mainly because it might be dangerous in the stairs. In fact, in the before picture you can't see them at all !!!! Not so long ago I decided to unsubscribe from magazines. And of course, stop the magazine reviews the way I used to make them. I was less and less interested in what was in UK magazines, and reviews were becoming more and more grumpy and not so nice to magazines and designers. And I personally think it's unfair to make negative reviews when some people with different tastes than mine might enjoy the magazine designs. I think a bad review has more impact than me simply saying "I didn't like any of the designs in this magazines, so I don't buy it". Freebie: teddy Christmas kit from Andree Langhorn. This kit in itself justifies to buy this issue. Not only is the design lovely and delicate, but there is also metallic thread and a star charm. Not to mention the mount. First we have a Sheila Hudson orchid. If I'm not found of those big flowers, I like the way it's mounted, like a painting canvas. It gives it a modern look. She also made purple cushion with flowers and butterflies. And a dragon. Then we have a cake band sleigh from Joanne Sanderson. Each individual sleigh might make a nice ornament, or together as a banner, but... on a cake? But don't worry, there are other ideas... I like the mantel piece garland, where you can hang cards on. Next we have the 4 seasons kitties from Margaret Sherry. I like the idea of sewing them on a bag, even if I won't do that. I feel like stitcher the Autumn one, with the fallen leaves. 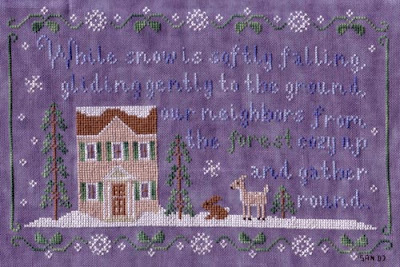 "Walking in a winter wonderland" fron the Historical Sampler Company is a radical change from the rest of the designs, more traditional. I like it. Zoe Patching made pet bowl designs. Original idea for a gift for a dog or cat owner, but it won't come cheap, as the bowl for insert is 10 pounds !!!! Helen Philipps made a family tree, very cute and rustic. Diane Machin made "get well soon" cards. There you have it. 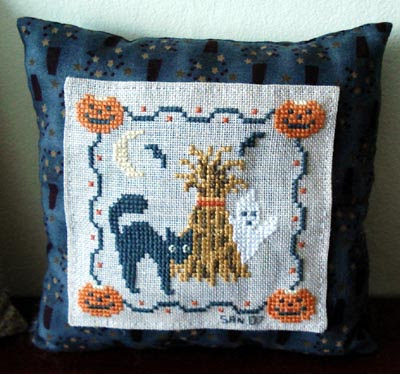 I might stitch the freebie and the MS cats. Here is Garden Pleasures after about 5 hours of work. It's really really nice to stitch. And it's a nice change from Fall and Christmas. A leisurely week end approches, and I have quite a few things to do craft wise. First, framing and sewing. Then sorting out a plan of what i have to stitch, Christmas ornaments and such. Stuff are a bit everywhere, it's not really inspirationnal. Yesterday we also had a bit of a heavy stormy rain, but no flood as such. I will only have to remove the leaves from my front garden, I'm waiting for the wind to die out a bit. Before you comment how fast this project was stitched... I started this on Oct 16th. Jen, it's on dark cloudy linen, 28ct, but it tends to purple a little bit. I finished it this morning, before breakfast. For some reason, I tend to stitch a lot when DBF is around. Maybe because when I'm alone, I tend to do things slowly. Soon you will see Forest Snowfall as a cushion, to really cosy up the place with winter stuff. It's really the matching piece for Winter Wonderland, so once the cushion is done, I might bring it to DBF's for Christmas. He's a male, so he doesn't really have cushions, but my back needs support !!!! Hobbycraft just got some DMC variations, but instead of having the whole collection, they have the first and second series only !!!! It's a shame, really.... Does that mean they will always be like a year late? I'm already thinking about what I will stitch on my Christmas holidays. I know, it's a disease... Part of me wants to explore different craft venues, like beading. I also want to make a table runner for the hall table. design something with drawn thread and speciality stitches... But for some reason, I always end up doing "comfort stitching", which is why LHN patterns are so nice. Also, they correspond to what I want to see as decoration style in my house. For those who follow my crafting since a long time, you know I didn't like the simplistic patterns not so long ago. So what happened to me? I don't feel like stitching fairies or cute characters or anything... maybe I stitched too many? I am stitching the green and the white of the border in parallel, with 2 needles. I don't usually do that, I tend to make a big thread mess att he back with this "stitch and park" method. You can tell I'm back at work as I didn't stitch much ! I survived Bonfire night, all those fireworks really keep me on edge... and of course that makes DBF laugh. Tracy, I can't belive they are going to change Stich and Craft to a general craft magazine ! There are already too many paper/craft magazines, it will be the end of them. And of course that happens when i start liking the new formula... Oh well, more money for me from not buying mags ! I still have to figure out how to unsubscribe from CrossStitcher, the phone system didn't work... I stopped the direct debit at the source anyway, so eventually they will figure it out by themselves. Yesterday I went to Hobbycraft to get a frame for Acorn Hill, and they have a 25% off on frames until Nov 11th, so I will have to go back with Tearoom and Renaissance Lady. I feel the frame I took for Acorn Hill, clear pine, isn't really what I need, so I will try something darker. But it will have to wait until Wednesday evening. Kris, I'm like you, my tastes in stitching keep on changing, visiting the gallery shows how different my projects are. I prefer smaller projects, because I tend to loose patience with projects. Now, on a variation on that theme... Jaqueline, I stopped doing magazine reviews. Lately I noticed I didn't want to stitch anything in those magazines, and the reviews ended up saying "this is crap crap crap". But of course, this is my opinion. It's unfair for the magazines and the quality of the designs. Then there is the money aspect of it. Why would I pay for stuff I vaguely look at before throwing the whole thing in the recycling bin, when I can use the money to buy stash and charts I like? The project finds itself finished in a day !!! You can guess we didn't do much yesterday... I spent most of my time stitching, "just a little more..." "just this colour then that's it" " Oh, just to leave the border for tomorrow.."
And that's how Acorn Hill is completed. Now that I see you found the way to my new blog and commented, I shall try to stop pestering about comments. Like Lili says, counters tell you if the place is visited, but my concern was because of the change of adress, and people like Chiloe forgetting to change their feeds (or like me, I tend to do that as well). But I can't help craving for comments. I'm too busy to go to forums and the like, so they are usually my only contact to the other stitchers. Anyway, I will take Forest Snowfall again, start Garden Pleasures... and start to think about Christmas and gifts. You might have noticed I changed the top banner. New house, new garden, new banner. I'm not really happy with it, but it will have to do until I make the winter one. It's an odd time, when I don't know how long I will keep my Halloween/Fall decorations, on the blog and in my house. Most of the Christmas decorations I made last year are inFrance at DBF's (where I spend the Christmas holidays), so I will have to mostly make new ones in order to replace the cushions on the mantel piece. Acorn hill is growing little by little. I suppose I should hurry? 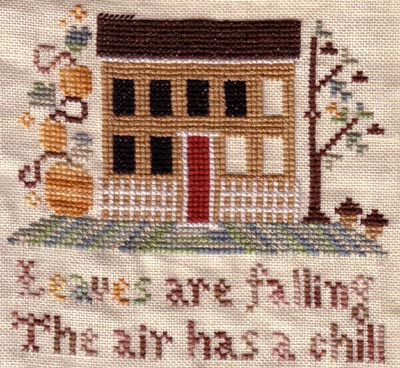 Little by little, I''m stitching on the Acorn Hill project. This will be the last Fall project of the year I guess. You can see I'm taking quite some liberties with the colours. If I used some variegated colours for the green and orange, the browns will only be variegated on the words and the border. This is to get more control over the final look. The grass has to be stitched in diagonal with variegated, and the effect is stunning (in my opinion). Very original. In other matters, I finally got my issues of CrossStitcher and WOCS, not that I missed them much... I bought CrossStitch Crazy yesterday, because there were some mini Christmas frames and lovely mini fairies. Other than that, not much happens... I tried to get my blog on blogspot look roughtly like the one on my website, it's still not perfect, and its still missing elements, but... you get the idea. Anything you really want to see in here (and that is possible in Blogspot), tell me as I intend to spend my big week end stitching, and not webdesigning (it will probably be for next week end). Final version of the mantel piece, with the finished "Spooks are out". Note that I added the Waxing Moon Short stack I framed last year, and the MillHill pins. We had crepes and watched creepshow.